Hand sanitizers seem like a wonderful product to have on hand at first glance. Who wouldn’t want quick and easy access to clean hands that you can tuck away into a purse or car glove compartment and use on the go, during those situations where hand washing is either inconvenient or downright impossible? Recent research published in the Public Library of Science suggests that usage of hand sanitizers that contain triclosan may be harmful, as topical use of triclosan can increase the body’s absorption of bisphenol A (commonly called BPA). This chemical can alter endocrine function by introducing excessive synthetic estrogens into the body, which can potentially have a negative long-term impact on health. BPA is a substance once commonly found in plastics and still used today in store receipt paper, making it a threat to cashiers—especially those who frequently use hand sanitizer (BPA is one of the 7 reasons to ditch plastic containers). Triclosan itself has raised questions about its safety to human health. Research has shown that triclosan affects hormone regulation in animals, may contribute to the development of antibiotic-resistant germs and might be harmful to the immune system. Like BPA, phthalates and parabens can also interrupt normal function of the body’s endocrine system, leading to early onset of puberty and increased incidence of obesity and even cancer. Even so, they can commonly be found lurking in a variety of products many people keep in their homes, including commercial hand sanitizing products. Yet another reason to steer clear of store-bought hand sanitizers. Not all hand sanitizers use triclosan. Some products use alcohol, which is more effective as a sanitizer and is safer for human health than triclosan-containing products when used as directed. However, products with a high alcohol content can pose a serious danger in homes where children live, as a small child who accidentally ingests the product could fall victim to alcohol poisoning. Hand sanitizers are intended to be used to ward off bacterial infection. However, multiple studies have shown that use of these products has backfired badly. Rather than keeping bugs at bay, the prolific use of hand sanitizers and other antibacterial products has led to bacteria becoming resistant to those products, making these bugs more difficult to eradicate using previously effective measures. Thus, hand sanitizers do nothing to kill drug-resistant bugs like MRSA, and may, in fact, be helping these “super bugs” proliferate instead! According to research published in the Environmental Health Perspectives journal, use of triclosan was found to be associated with the development of seasonal allergies in children under the age of 18 who were exposed to the substance. It is possible that the impact of triclosan on the endocrine systems of these young people is connected to their immune function, leaving them less apt to fend off allergens than their non-triclosan-using peers. Not only can the ingredients in hand sanitizers be harmful to human health, it can also leave a big, ugly footprint on the environment. One study published in Aquatic Toxicology showed that even after going through a treatment plant, water containing triclosan could not be fully cleansed of the substance, meaning that triclosan was being released back into the environment even after treatment measures had been taken to remove it from the water. This means that toxic triclosan can be going where it has no business being: right into the water that goes to the taps in our homes. 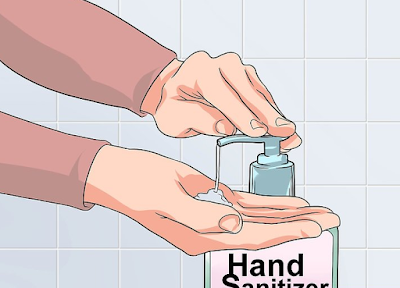 A safer solution for sanitation: make your own natural hand sanitizer! There are natural methods that you can use to keep your hands clean without ruining your endocrine system or contributing to environmental toxicity. Tea tree oil is a natural anti-bacterial, anti-fungal and anti-viral, making it an ideal alternative to alcohol-or-triclosan-based sanitizing products. Stir this mixture together and pour it into a spritzing bottle. To use, spray it on hands and rub the hands together vigorously until they are dry, just as you would with a commercial hand sanitizer. Keep the bottle in a convenient location and use it as often as needed—without the fear of toxicity! If you prefer a gel sanitizer to a liquid spray, aloe vera gel can help you to get clean hands naturally. Mix 10 drops of tea tree oil in a bowl with one ounce of witch hazel and five ounces of aloe vera gel. Scoop the mixture into a squeezable bottle and store in a cool place. To use, squirt a dime-sized dollop into the palm of one hand and then rub your hands together until they are dry. Now you can have the convenience of a gel-based sanitizer without the health concerns of commercially available sanitizing products! The above reasons are just a sampling of the potential dangers of products we take for granted, such as commercial cleaners and skin care products. You need to take an active interest in the products you rely on to keep yourself and your family safe. Research the products you use regularly and search the ingredients. This is an integral part of the detox concept. This includes not only detoxifying your body, but detoxifying your mind, home and environment as well.